The Swiss-Swedish technological giant ABB got contracted to build the infrastructure that is set to connect a new wind farm in occupied Western Sahara to Morocco's national electricity grid. The Swiss-Swedish ABB Group, headquartered in Baden, Switzerland, is involved in the Aftissat wind energy project near Boujdour, occupied Western Sahara. Its mission is to buid a so-called hybrid substation that will connect the new wind farm in Western Sahara to the energy grid of Morocco, the country that illegally occupies Western Sahara. Saharawi refugees protested against the Swiss-Swedish company's contract for the Moroccan government on occupied land. ABB first announced in a press release in July 2017 (or download) that it "is working with Energie Eolienne du Maroc" to build a new hybrid substation with "a capacity of 225/33 kilovolts (kV), with the ability to be upgraded up to 400 kV or the wind farm upgraded to 300 MW". However, ABB did not specify where this operation would be undertaken. Instead, the announcement stated that the work would be undertaken in "southern Morocco" - a vague description that ofttimes refers to Western Sahara. Its partner Energie Eolienne du Maroc (EEM) is a subsidiary of Nareva, which is owned by the Moroccan palace. Nareva owns all public wind farms in occupied Western Sahara. The vague statement from ABB led the Swiss association terre des hommes schweiz to start a correspondence with the company. Terre des hommes wrote to ABB on 25 April 2018, asking the company to specify where the substation would be located: in Morocco or in Western Sahara. The NGO furthermore asked if ABB had any further planned projects in the same area, and whether it had obtained the prior consent of the people of Western Sahara, as represented by the Frente Polisario. A reminder was sent on 15 May 2018. ABB replied on 11 June 2018 that the project would be carried out in Aftissat, near Boujdour. 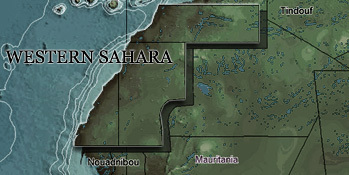 The company did not specify further, but that is indeed in the part of Western Sahara that is under Moroccan occupation. On the issue of consent, the firm noted that it had "not had direct contact with local political stakeholders". Aftissat is a 200 MW wind farm that is expected to be operational in early 2019. Morocco has huge plans to capitalise on the wind energy potential of the two-thirds of Western Sahara that it holds under illegal military occupation since 1975. WSRW's calculations suggest that by 2020, a staggering 40% of Morocco's wind production will in fact take part on occupied land. And practically the entire production is controlled by Nareva - the company of the Moroccan king himself, and thus making him the biggest electricity producer in Morocco and Western Sahara. The people of Western Sahara oppose this development. In their view, the energy infrastructure will entrench Morocco's occupation, as Morocco becomes more reliant on its presence in Western Sahara to satisfy its energy needs. Most of generated energy is destined to industrial end-users, facilitating Morocco's exploitation of the territory's resources. And as the renewable energy development in Western Sahara is highly lucrative to the king of Morocco, he will have little incentive to credibly engage in the already deadlocked UN-led peace talks. "Western Sahara Resource Watch urges ABB to respect international law, international humanitarian law, the recent judgments from the EU Court of Justice, and the rights of the people of the territory. Partnering with the king of Morocco in building energy infrastructure on occupied land is grossly unethical. We advice all investors to engage with ABB to instruct them to immediately cancel the contract and withdraw", Sara Eyckmans of Western Sahara Resource Watch stated. At present, there are two operational wind farms in the territory: the privately-owned CIMAR wind farm (5 MW) that delivers the necessary energy for the cement factory; and the 50 MW Foum el Oued farm near Western Sahara's capital El Aaiun which provides 95% of the energy required to run Morocco's exploitation of Western Sahara's phosphate mine. Two farms are planned to be constructed as part of Morocco's Integrated Wind Energy Program; the 300 MW Tiskrad farm and the 100 MW farm near Boujdour. Those projects are on hold due to financial constraints: most funders, including the EDB, EU and KfW, have restricted their funding to projects in Morocco proper - not Western Sahara. The Aftissat project is being financed by Moroccan banks. Another 400 MW wind farm is planned to be constructed near Boujdour. Find a map depicting all wind farms below. ABB teams from Spain, Morocco, Italy, Turkey, Switzerland and Sweden have been involved in the $16 million Aftissat substation. In addition to ABB, German Siemens, Enel (Italy) and Windhoist (UK) are involved in projects in Western Sahara in the energy sector. 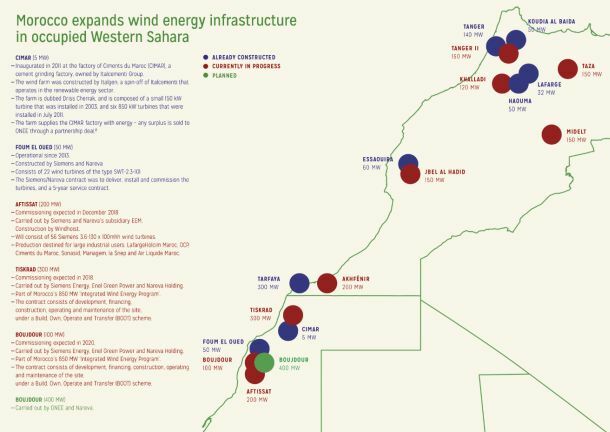 In November 2016, WSRW released the "Powering the Plunder" report, documenting Morocco's wind energy plans in Western Sahara. That report did not include the Aftissat wind farm or the rumoured 400 MW Boujdour wind farm. At the time, it could be calculated that by 2020, Western Sahara's share out of Morocco's total wind energy production would be 22,5% (450 MW out of a total of 2000 MW; comprising of operational, planned and under construction wind farms). Now including the two new farms near Boujdour, that share will go up to 40,3% - as there appear to be no new plans in Morocco proper (latest available data from June 2017). The map below (click for high resolution) includes the Aftissat/Boujdour farms, but not the large farm to be constructed in Dakhla.